The iconic dome and architecture of the USNA Main Chapel is a famous fixture in the Annapolis skyline. Standing as a focal landmark in the area, the Chapel remains a point of reference for Midshipmen, alumni, and Annapolis visitors. The Chapel is a non-denominational Christian chapel. Sunday morning protestant and catholic services are open to the public. The Jewish Chapel, attached to Mitscher Hall, has services on Friday evening and is open to the public. 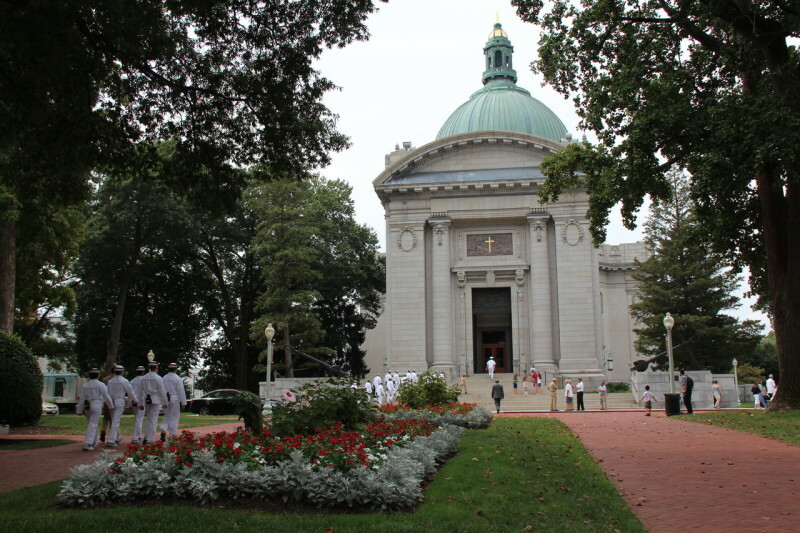 Midshipmen are not required to attend Chapel services. Many attend services in town. The Chapel was built in two sections. Ernest Flagg designed the original section, which accommodates 1,600, in the shape of a Greek cross with four equal transepts. Admiral George Dewey laid the cornerstone in 1904; construction was completed in 1908. The Nave was added in 1939-40. It changed the Chapel shape to that of a Latin cross and increased the capacity to 2,500. The Chapel is included on the guided walking tour of the Naval Academy which begins at the Leftwich Visitor Center inside Gate 1. Anyone 18 and older must have a photo ID to enter Academy grounds.